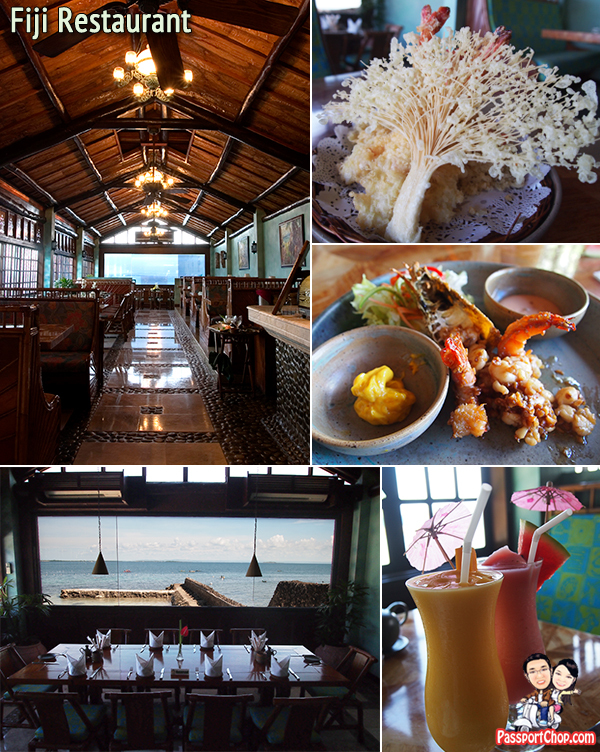 Besides fun indoor activities and water sports, the dining experience at Plantation Bay Resort & Spa is something we had looked forward to during our weekend getaway at the resort. 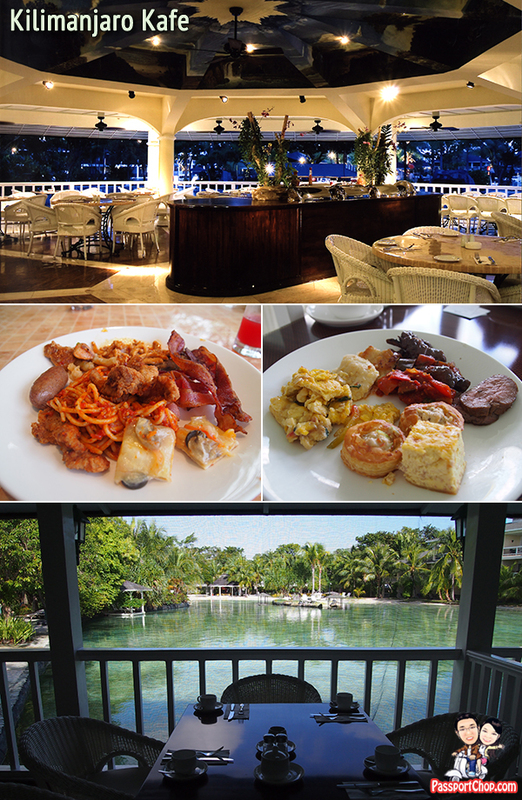 There are 4 restaurants/cafes to choose from at Plantation Bay Resort & Spa – each offering different cuisines. Our favorite was the Fiji Restaurant (located just by the Galapagos Beach) which specialises in seafood. I recommend the Prawns Tempura (980 PHP) which comes with four jumbo prawns (according to the menu, the largest you have ever seen in tempura – very true!) as well as other fried vegetables prepared tempura style. The Broiled King Prawns (980 PHP) served with lemon and chili sauce also tastes great. See picture above for what these dishes look like as well as what the restaurant interior looked like – check out the great view of the sea off the Galapagos Beach from Fiji restaurant. Fiji restaurant is open for lunch and dinner. Al fresco and air-conditioned dining options available. Closed on Mondays. 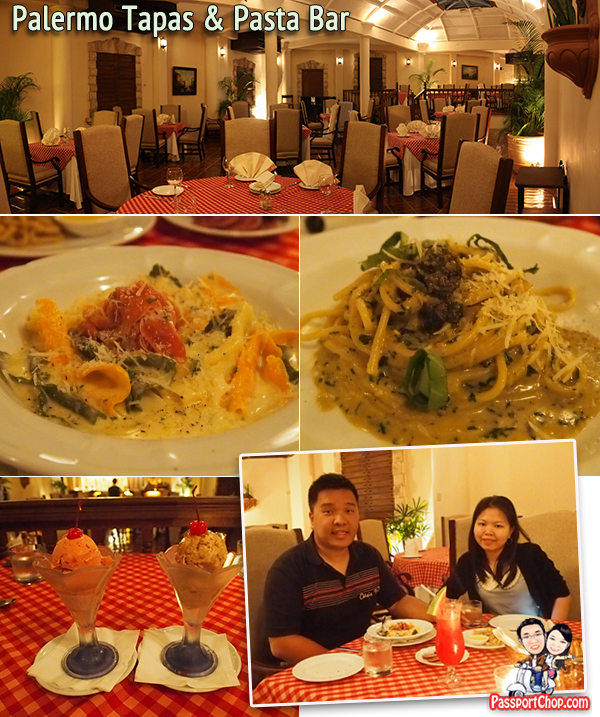 If you like Italian pasta and Spanish tapas – then the Palermo Tapas Pasta Bar is a perfect dining spot for you. We loved it so much that we went back a second time during our stay! What we loved was the ambiance (the live singing performance was great and the whole restaurant had the authentic Italian dining experience with the typical red/white checkered tablecloths!) and of course – the food! For tapas, I recommend the Calamares Fritos – lightly fried, crispy squid cooked Plantation Bay style and the Gambas – garlic prawns served hot and spicy. For pasta, I recommend the Ravioli Al Granchio (which is something like a plate of small crabmeat dumplings) and Spaghetti Al Pesto – pasta served in a creamy ‘Pesto of Basil, Pine nuts, Garlic and Parmesan’. Palermo is open for light breakfasts, coffee all day, and Spanish tapas and Italian pastas for dinner. Closed on Wednesdays. If you just want to grab a quick lunch/dinner bite, Savannah Grill and Lounge is your best bet! The menu at Savannah Grill is differentiated by how long it takes to prepare the food from 0-2 minutes for Salads and Desserts (e.g. the Great New York Cheesecake (80 PHP)) to 10 minutes for Chicken or Pork BBQ with rice (400 PHP) to 20 minutes for the Powerhouse Burger (430 PHP) – the famous Plantation Bay burger with choice of Sauteed mushrooms or onions, bacon, onion rings, fried egg, cheese, sesame seed or pan de sal bun. The Savannah Grill also serves the US Angus Prime Rib and American Wagyu. In the evenings, you can also sing the night away at the Savannah Lounge karaoke! 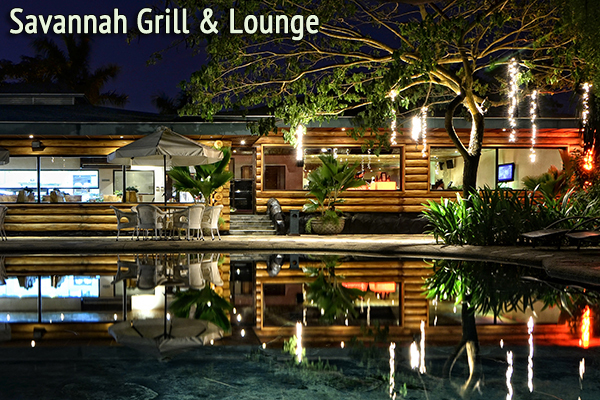 Savannah Grill is open daily 10am – 7pm. Closed on Tuesdays. The Kilimanjaro Kafe coffee shop is surrounded by Plantation Bay Resort & Spa’s gigantic freshwater swimming pool. The Kilimanjaro Kafe is open 24 hours and features international and Filipino favorites, a special children’s menu, and Plantation Bay Resort & Spa’s world-famous Breakfast Buffet with different culinary themes for every day of the week. Yes – instead of the same old buffet breakfast that you would expect of hotels and resorts, Plantation Bay Resort & Spa serves up a different breakfast menu everyday – we tried Italian pasta and pizza one morning and the next we are having delicious French pastries! The Kilimanjaro Kafe lunch and dinner menu are the same but with such a large selection of food from different cuisines e.g. Western, Asian, Filipino – you won’t get bored eating at Kilimanjaro Kafe all day. I recommend for starters – the Plantation Bay Cream Soup (220 PHP) – clam chowder, but lighter. For main courses, I would recommend the Stir-fried Mixed Noodles (medium – 480 PHP) which is glass and canton noodles served with pork, squid, mussels, shrimps and vegetables. Also worth a mention is the Powerhouse Cheeseburger (430 PHP) which features a powerhouse cast of 6-oz grilled beef burger, cheese and a choice of bacon, mushrooms or fried egg. Another highlight of dining in Plantation Bay Resort and Spa is the nightly Open Dinner themed buffet! For a flat rate of 1595 PHP nett, you will get to enjoy a sumptuous buffet spread with an exciting dance performance e.g. for Monday, you get a Spanish themed dinner – Viva Espana where you can enjoy an evening of Spanish food and dance! We checked out the Brazilian Fever night on Saturday and the performance was awesome and very entertaining – the dancers were also very sporting – staying back for photos with guests after the performance. What’s really surprising is that these dancers are actually Plantation Bay Resort staff! These dances are on top of their day jobs around the resort so you might find familiar (of course, they are paid extra for dancing!). Although these dances are performed by staff holding day jobs at Plantation Bay, don’t underestimate the performances as they put in extra effort and time for rehearsals after work and perform regularly so you can expect very good quality performances from them. Check out the video below for a sneak peek at what to expect for Brazilian Fever. These performances are typically held at one of Plantation Bay Resort’s beaches (with outdoor buffet dining) if weather permits – the wet weather plan is for these performances to be held at the Kilimanjaro Kafe. There are no performances on Sunday. Dinner starts at 6.30pm but the actual performances typically start after 7pm. Hello to all, it’s genuinely a pleasant for me to pay a visit this website, it includes valuable Information. I am sure I can visit the place for a second time soon. I really like the ambiance in Fiji restaurant. The whole family will surely fall in love with the place. For a sophisticated dinner, the Kilimanjaro Kafe would be perfect. Your partner or even the rest of your family would enjoy the classy interior of the place.